Located 2km north of Great Swindon Island is a chain of three islands called either Three Islets or Three Stooges but more commonly called Shark Cave by Burma dive boat operators. And Burma diving doesn’t get much better than this. The larger and middle of the three islands is the one with the cave that has made the dive site famous. The cave starts as a large cavern entrance on the north west corner of the island at 5m below the surface and drops down to 16m. The cavern gradually narrows inside until forming a tunnel about 20m long through to the east side of the island. There is a smaller tunnel chamber accessed by a metre wide hole. Large tawny nurse sharks are the most common sharks seen in the tunnel. Grey reef sharks are also seen on the outside of the tunnel and some divers encounter them as they swim through the tunnel which can get hearts pounding a little faster. 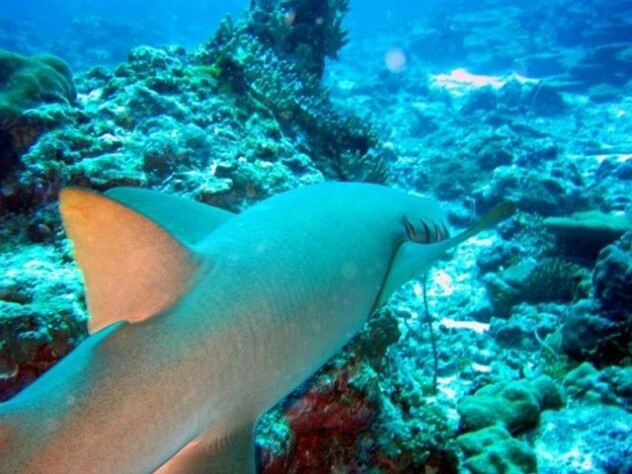 Although grey reef sharks have been known to show aggression to divers, as long as you stay low and to one side of the tunnel, allowing the sharks free passage, there should be no problems. Surge can make navigating the tunnel tricky at times. The cavern entrance is full of fish including longfin trevally, yellow tail barracuda, cave sweepers and glassfish. Lionfish and bearded scorpionfish also frequent the cave. Shrimps and nudibranchs are also numerous and a good dive light will help to illuminate the darker crevices. Also look out for moray eels in the cracks between sponge encrusted rock and zigzag clams. Most divers exit the tunnel on the east side and turn left to the north where a sloping reef down to 25m is covered with hard and soft corals, sea fans and feather stars. Magnificent anemones are home to the western clownfish and carpet anemones to Clark’s anemonefish. Pink anemone fish and tomato anemone fish are also present. On the edge of the reef in the sand it is common to see double ended pipefish. In the seafans, ornate ghost pipefish and seahorses can be found. Common and twin spot lionfish are numerous. Banded sea snakes are often seen hunting over the reef. All the usual reef fish including schools of snapper and fusiliers plus sweetlips and wrasse are abundant. The west side of the island is a wall dive down to 30m and is also full of life including fimbriated, white-eyed, yellow margined and giant morays. This is also an excellent spot for a night dive when dancing Durban shrimps (hingebeak shrimps) can be seen in their millions along with banded boxer shrimps, wandering cowries, decorator crabs, round crabs, hermit crabs and painted rock lobster to name just a few of the many smaller critters present. Orange cup corals, prolific on many Burma dive sites cover large parts of the wall. Red finger coral and purple soft coral add colour to deeper rocks boulders where white tip sharks can often be seen hiding. To the north of shark cave island is a small rocky outcrop called Square Rock that although tiny above water, expands below the surface. The wall drops vertically down to about 15m before sloping out to the sand at 28m deep.The reef walls are covered in soft coral and encrusting sponge plus sea fans and crinoids. Scorpionfish on the walls are huge in size. Banded pipefish are tiny. Moray eels are prolific. White tip reef sharks can be seen on the reef edges and under rocks. The southern most rocky outcrop of the three islets is called The Pinnacle and drops down below 30m. It is small enough to be circled in a single dive if currents pernit although they can be strong at times. Pelagic species like rainbow runner, barracuda and trevally are common. Cuttlefish are often in the shallower areas as well as porcupine fish and pufferfish including the yellow cube puffer.